Biggest strength in 2016: The stat sheet doesn’t necessarily reflect it, but the Blue Devils have a great young core of defenders on which they will build this season. Rising seniors CB Jevon Elmore (71 tackles, 16 pass breakups) and DE Asia Bolling (14 1/2 tackles for loss) were two first team all-NEC performers from last year that will be expected to lift the Blue Devils’ defense to a higher level, as well as NEC defensive rookie of the year DT Chris Tinkham (12 tackles for loss). Biggest Challenge In 2016: CCSU’s offense was decimated last year by injury, and will need to bounce back in order for the Blue Devils to compete for the NEC title. 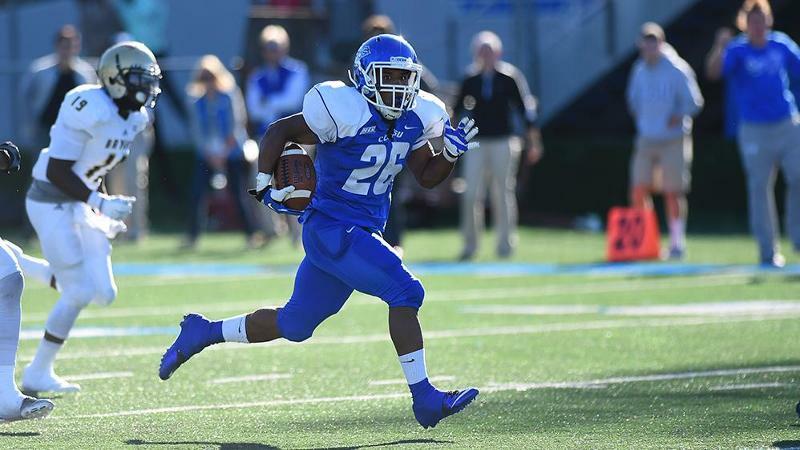 A healthy set of running backs, something CCSU didn’t enjoy for long stretches last season, will be essential. Biggest Departure: Last year’s starter, QB Tavion Pauldo, left the CCSU program in the offseason because he “didn’t want to compete for the starting job”, according to Rossomando. Fortunately the Blue Devils have an experienced backup in QB Jacob Dolegala, but his departure still could effect the first few critical games of the year. Player To Watch: RB Cameron Nash led the Blue Devils in rushing last year with 676 yards rushing, and added 18 catches for 272 yards. He’s clearly the go-to back in the offense, when healthy, but what’s more interesting is what could happen if Nash gets some better support from the other backs in the backfield. Biggest Game: vs. Lafayette, 9/2/2016. The Blue Devils’ out-of-conference schedule is fairly brutal, with away tilts at FBS-bound Coastal Carolina and ought-to-be-FBS-bound James Madison. With likely losses in those two out-of-conference games, beating a beatable Lafayette team at home to open the season might be a critical place to get some positive vibes and motivation before NEC games start to occur. CCSU In Two Sentences: Coach Rossomando seems to be on the right track, building a talent base slowly but surely, as he did at New Haven. But will there be enough depth on the whole team to have the Blue Devils get back to challenging for NEC titles?